If you have read some of my past posts, you may remember that I have mentioned that my class has some trouble ripping paper. I decided to incorporate that into my bulletin board this month. I chose the theme of "In like a lion, out like a lamb." First on the computer I made the Headers of "March," "Comes in like a lion," and "Goes out like a lamb." I then printed them all out. Next came my non-artistic skills--I did the best I could. I made a big lion and a big lamb. I was getting pointers from my kindergartner. I then put scraps of orange paper in one envelope, and scraps of white paper in another envelope. I have glue in a basket on the shelf right by the board. The children have to rip the orange paper in strips to make the lions mane, or rip small pieces of white paper to make the lamb woolly. Let' keep our fingers crossed. Forgive me, each child has the opp to glue in this board? how does that work out? do ur parents know about the board? was this something that yoru company asks u to do? i ask because i love the idea!! a lot of time must go into a board like that. do ur parents see the board, my parents have a lot of trouble paying attention to that stuff, any ideas on that issue? would this be an idea similar to a actvity table? every child adds one colored item to the correct rainbow color? This is actually the first time I have glue involved with our interactive board, so we'll see how it goes. My thoughts were that I would have to throw away eveything when they are done. I was actually at a workshop last year and they talked about interactive boards and how much fun the children think they are. Also that it gives them a feel of helping to decorate for the month. So in all acutallity, it's my fault we do this:). The parents don't always get to see them. If they come in the room they do, but I'm not sure they take notice. I also post them on my site, but again I'm not sure who reads. We try lots of tricks of the trade to involve parents, haven't yet found the golden tactic. I'm not quite sure of the last question. If you're asking if your rainbow idea might make a fun activity it sounds good to me. I think anything that involves the children will work. Have fun! Hi! 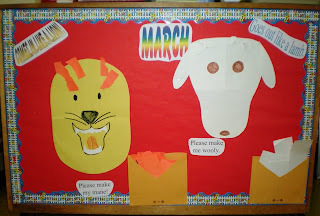 We wanted to let you know that we featured this fantastic interactive bulletin board at our blog, Bulletin Board Ideas. We made sure to give photo credit as well as a link back to your website, but we'd love for you to check it out and, if there are any problems, we'll be sure to take the feature down immediately!